Oysters are a type of shellfish belonging to the bivalve mollusk family, which also includes mussels, cockles and scallops. They can are edible and can be consumed raw or cooked and are often ingredients in soups and sauces. Along with being a good source of iron, vitamin B-12 and selenium, oysters are a very rich source of the mineral zinc. Zinc is an essential trace mineral that is required by the body, but only in small amounts. Oysters can be prepared and consumed a variety of different ways and may be farm-raised or wild from the ocean. All these factors affect the zinc content in oysters, and all Percent Daily Values of zinc mentioned are based upon a 2,000 calorie diet and 3 oz. of oysters. 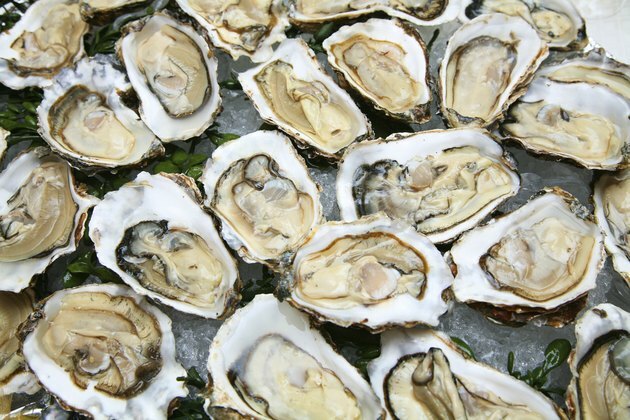 Cooked oysters from the Pacific Ocean contain 188 Percent Daily Value of zinc, and raw oysters from the region contain 94 Percent Daily Value, according to Calorie Lab. Eastern farm-raised oysters contain 214 Percent Daily Value of zinc when raw and 255 Percent Daily Value when cooked in dry heat. Wild Eastern oysters cooked in moist heat contain 1,029 Percent Daily Value of zinc and 417 percent when cooked in dry heat. Lastly, Eastern canned oysters contain 515 Percent Daily Value and Eastern breaded and fried oysters contain 493 Percent Daily Value of zinc. Zinc serves a variety of important functions in the body. It participates in cellular metabolism and is required for the production and activity of many enzymes and proteins. It is required for proper growth and development of the fetus as well as on through adolescence, according to the Office of Dietary Supplements. Zinc supports a healthy immune system and is required for the sense of smell and taste. Adequate zinc intake may also slow the progression of the eye disease known as age-related macular degeneration, according to Harvard Health Publications. The Institute of Medicine recommends 11 mg of zinc per day for males 14 years of age and older and 8 mg for those ages 9 to 13. Females should consume 8 mg of zinc per day and pregnant and nursing women between 11 and 13 mg per day. Infants need 2 mg to 3 mg per day and children ages 1 to 8 need 3 mg to 5 mg per day of zinc. Harvard Health Publications states that vegetarians absorb less zinc in their diets and should consume double the recommended daily recommended intakes. The upper limit intake of zinc should not exceed 40 mg per day, according to the Institute of Medicine. Zinc deficiency is rare in the United States due to its abundance in a wide variety of foods. However, certain populations may be at an increased risk of zinc deficiency. These groups include individuals with sickle cell disease; vegetarians; pregnant and lactating women; alcoholics; and those with digestive disorders such as Crohn’s disease, malabsorption syndrome and ulcerative colitis, according to the Office of Dietary Supplements. Zinc deficiencies may cause impaired growth and development, decreased appetite and weight loss, poor immune function and wound healing, skin problems, and lack of taste and smell, according to the University of Maryland Medical Center. Does Zinc Deficiency Affect Our Taste Buds?